President Obama, on the South Lawn of the White House in July. President Obama’s job approval ratings have been climbing of late. The president crossed the 50 percent approval threshold back in March for the first time since 2013, and he’s on track to finish his final term with a majority of Americans approving of the job he is doing.1 It’s only a slight majority, but that still looks pretty good compared with the approval ratings of other presidents since the end of World War II. Presidents’ approval ratings tend to go up once they reach lame-duck status, after their successor is picked but before Inauguration Day. So it’s possible that Obama’s approval ratings, already pretty decent, will tick up several points before he officially leaves office. Note: Job approval ratings for past presidents are taken from the last poll in October, the last month in their final year before they became lame-duck presidents, and the last poll of that year. John F. Kennedy and Richard Nixon, who didn’t finish full terms in office, are excluded. * Obama’s approval rating is from the end of July. Obama has rarely been held in such high regard. Unlike Ronald Reagan and Bill Clinton, who both enjoyed high approval ratings through much of their presidencies, Obama has mostly had approval ratings below 50 percent: Only in 2009, after his first inauguration, and during a short “honeymoon” period around his re-election did he garner the approval of a majority of Americans. With both Hillary Clinton and Donald Trump historically disliked, it’s easy to see Obama’s recent popularity as a reaction to the candidates trying to replace him, rather than a change in how the public evaluates his performance. 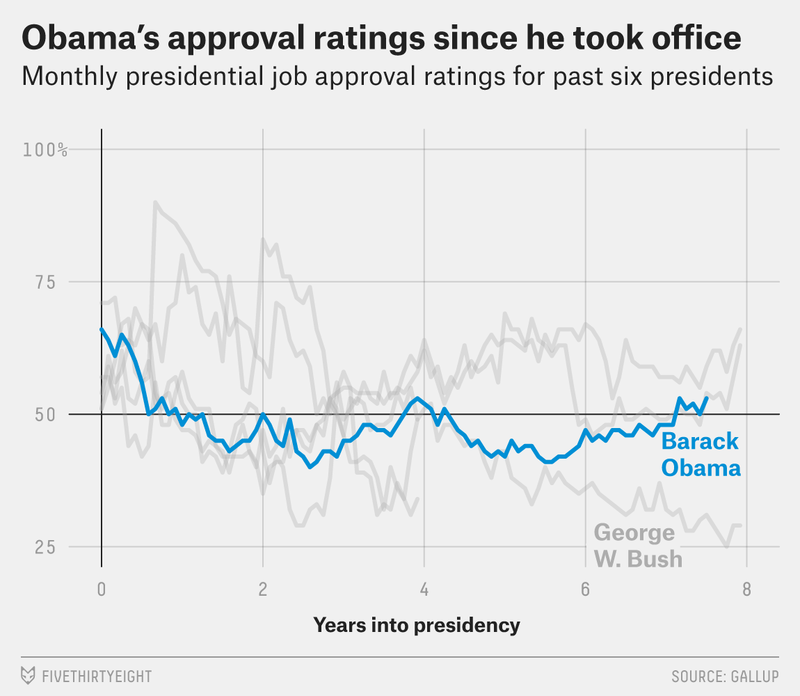 But, as the chart above shows, approval of Obama began to creep up in the summer of 2014 (a little over five years into his presidency), long before anyone but political diehards was thinking about 2016. Obama’s approval gains accumulated relatively gradually over the past two years. That doesn’t disprove the hypothesis that some voters are looking at their choices in 2016 and seeing Obama in a more positive light, but it does suggest that’s not the only factor at play. Obama’s higher approval ratings also stand in the face of the “second term curse,” a piece of political conventional wisdom which holds that presidents tend to become less popular in their second term than in their first. FiveThirtyEight editor-in-chief Nate Silver has written before about how the curse is “sloppy as an analytical concept,” and — as Obama shows — such a curse is by no means inherent or automatic. What’s more important, however, is that Obama’s rising approval rating may give us an early indication of how he will be viewed by future Americans and historians. Of the four previous modern presidents who finished their presidencies with a majority job approval rating, two rank among the top 10 presidents according to our aggregated scholarly rankings of presidents, and the third, Bill Clinton, is just on the edge, ranked 13th. (Obama ranks 18th of 43.) There’s still time in Obama’s last term for the numbers to shift, but if he retains his majority approval rating, that will be an accomplishment. David Nield is a former FiveThirtyEight politics intern. He is a student at the Ohio State University studying political science and statistics.